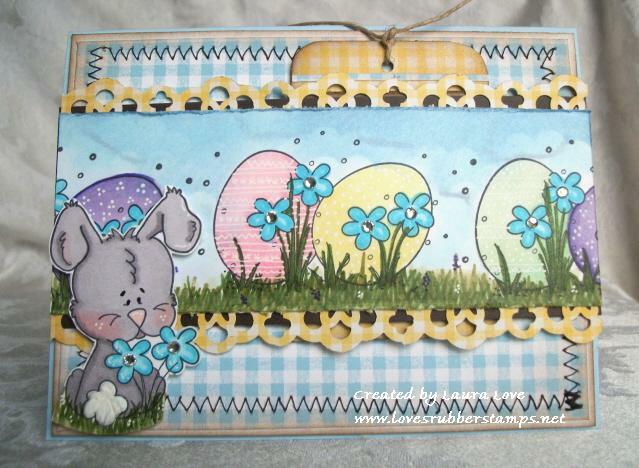 Loves Rubberstamps Blog: Easter Eggs For Sale! 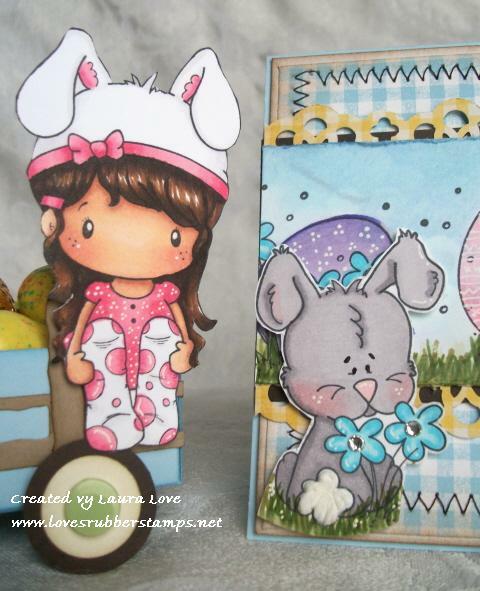 Today is a new Loves Rubberstamps Challenge and the theme this week is to create a tag or have a tag somewhere on your project. Well, I also serve on the Design Team for The Cutting Cafe and this week we had a super fun assignment of using Regina's new Little Red Wagon Template. I had a super cute project in mind that creates a little scene with a separate project for each but that are designed to go together...LOL... make sense? So my post today will be a merge of my Design Team Post for The Cutting Cafe and some details about how I created my project for the Loves Rubberstamps Challenge. Here is the set together... 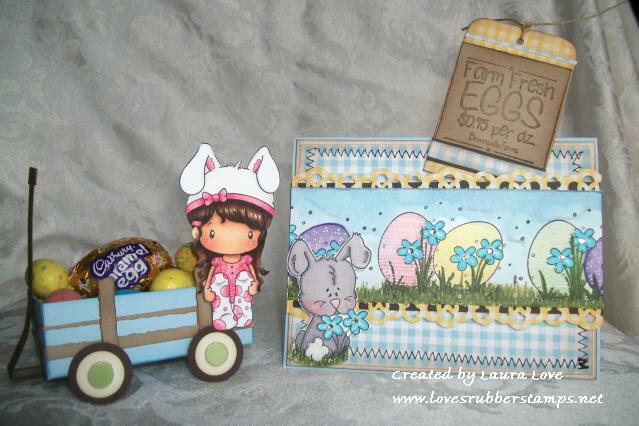 I created the little Easter Wagon using the Little Red Wagon Template for my project this week for The Cutting Cafe, and the fun Spring card with the homemade tag is for the Loves Rubberstamps challenge. Don't these look adorable together! Let's start with the cute wagon! Now...even though the name of this file is "Little Red Wagon" you can make your wagon any color you want - LOL! That is what makes it so much fun because you can change the colors for the seasons or occasions. I am thinking this would look super cute done up in fall colors with leaves and pumpkins in it...you know what I will be making come October :) This file also comes with three sized boxes that you make and stack inside also, some fun embellishments, and sentiments for your little care packages! You totally need this file...I am telling you! I colored her hair and skin with copics, and then used spectrum noir alcohol ink markers on her outfit. The Bunny and the Eggs are from the C.C. 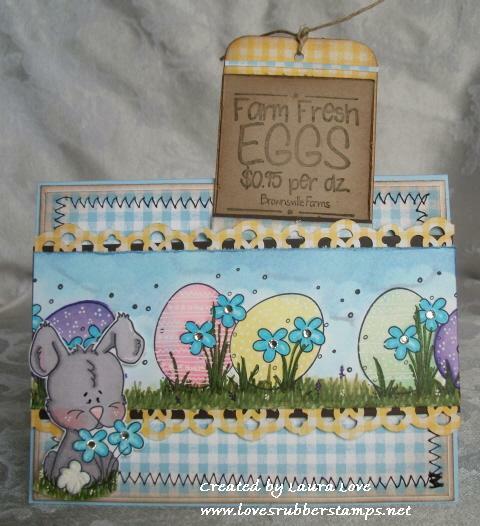 Designs Spring Has Sprung Stamp Set and the Eggs Sentiment is from their Spring Logos Stamp Set. This bunny is soooo adorable! I colored everything on this with Spectrum Noir Markers except for his little cheeks, that is the copic color R20. I liquid appliqued his tail for "fluff" and added bling to the flower centers and white gel pen designs to the eggs. Do you notice something new?? YEP... I tried sewing on my card for the FIRST TIME!! EEEKKK! I threaded the machine on my first try too!! Do you notice what is missing? YEP! No fingers attached! I didn't accidentally sew one to my card - LOL! I do need to study some YouTube videos of how to turn corners and how to stop when your finished but it will be fun to try and learn because I love the look of the sewn cards. Thanks for stopping by today! Be sure to play along with us this week in our Loves Rubberstamps Challenge.... AND... Be sure to stop by The Cutting Cafe and purchase the Little Red Wagon Template for yourself! You will seriously love it! Tomorrow afternoon at The Cutting Cafe's Blog you will get to see what the rest of the Design Team members did with their Little Red Wagons! I can't wait to see them because there is literally so many things you can use it for and decorate it with! It will be a blast! Hi there. What a fabulous project. So much fab work and wonderful detail. Pretty colours too. You rock Laura! This is awesome and your coloring is great! OMG! This is so adorable. Love the cute image and the colors and the little wagon and YOU SEWED!!! Yeah, you are no longer just looking at the machine like it's going to bite and you know this is such a great sewing job on the card, I love it! yeah you got in on the challenge! Thanks for playing with us over at ATS!!! 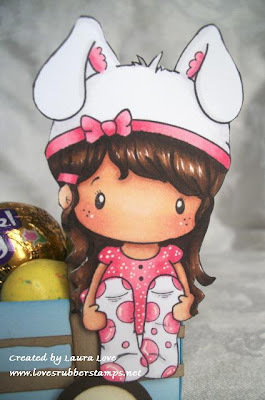 Hi Laura - this is a really cute little Easter gift. Love your sweet images and beautiful colouring! Thanks for sharing your projects at Incy Wincy Designs this week in our "Anything But A Card" challenge. How sweet! I love how you used the stamped image with your wagon. Great job. Ooooh this is FABULOUS! I absolutely LOVE it and I am so glad you shared this with us at Stamp and Create! What an amazing project! Do you need my address so you can send it to me?!? Lol! Good luck with the challenge and I hope to see you back next time! This is the SWEETEST project Laura! You are soooo talented! Oh my gosh, how fun. 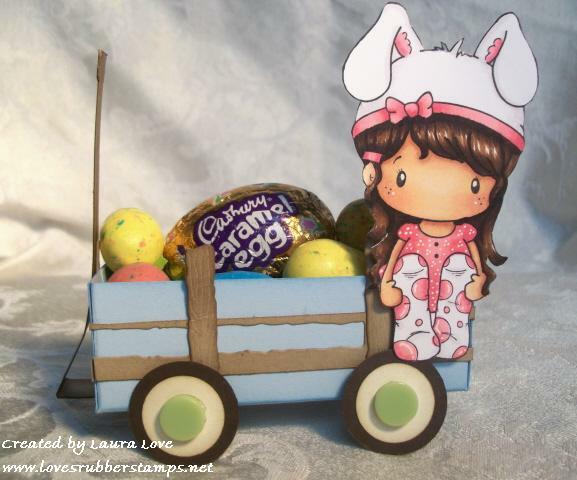 Love the card and the wagon full of candy, super sweet project. Thanks so much for joining us at SSD this week for our stitch it up challenge. eeekk - what a clever idea. Way to combine sets and files, lady! This is fantastic. I especially am fond of the rustic slats on the wagon. Great coloring, too. What a fantastic creation! Love this!! So glad you joined us at Incy Wincy Designs's 'anything but..' challenge this week!